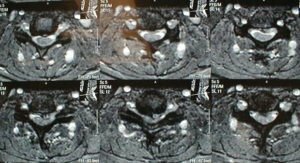 53 yo male with cervical stenosis and myelopathy treated with anterior decompression and fusion - Matthew D. Hepler, M.D. 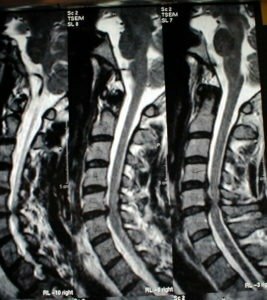 Case review: 53 yo male who developed neck and arm pain which progressed to include disabling numbness and weakness of the hands and balance difficulties with myelopathic reflexes (evidence of spinal cord damage and irritation). Imaging studies include an MRI which demonstrates disc herniations at C4/5 and C5/6 with spinal complete obliteration of the epidural space and severe compression and deformation of the cord. 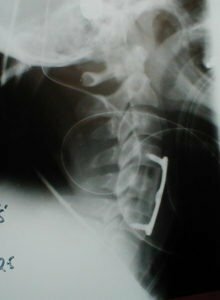 He was treated with an anterior corpectomy of C5 (removal of the middle 1/3 to ½ of the vertebral body of C5) with discectomies of C4/5 and C5/6. This includes resection of the posterior longitudinal ligament which allows visualization of the and observation of dural pulsations, confirming adequate decompression. The spine is then stabilized with a fibular strut allograft filled with local autograft and cervical plate and screws from C4-6. The patient had resolution of his neurologic complaints and neck pain and returned to full time employment without restrictions.